After reading the reviews about Veloflex Master clincher tires here, I decided to give them a try and bought a pair of them. Many people don’t know Veloflex as a bicycle tire producer; and few that do, will know them well. Veloflex is a small scale Italian operation built from the remains of Vittoria after that firm shifted production to Taiwan a few years ago. In fact, the staff at Veloflex have so much experience and talent, gained from their years of tyre manufacture at Vittoria before Veloflex existed. The company is very soon to hit the big time now that a certain Sir Bradley Wiggins won the Tour de France riding on a pair of Veloflex (with Veloflex Sprinter and Record tubular tires). First impression was nice. You can feel the “Handmade-in-Italy” quality when you handle them. Feeling the softness and the smoothness of the natural rubber is great. But what about the feel to riding on them? I put 120 PSI in them and hit the road (they can be inflated up to 145 PSI, I like high-pressure tires). And… It was beautiful. Riding on the Veloflex Master’s is a great feeling. They’re rolling really good, and cornering very well. You feel very safe when cornering, even downhills, even on the bad surfaces. I have tested Veloflex Master clinchers on bad, really bad road surfaces for miles and miles, and have had no problem at all. Puncture protection is really good, I didn’t have a flat until completing 2,000 kilometers. The only negative point is, they wear out a bit quickly. Specs say front tire wears after 6,000 km (3728 miles), and rear 3,000 km (1864 miles). But I think they wear out quicker than that. I can say 4000 km (~2500 miles) for front, 2000 km (1250 miles) for rear. So maybe it would be better to use seasonal training tires like Continental 4 Seasons or Vittoria Zaffiro for fall/winter conditions. Bonus: The natural rubber smells great! 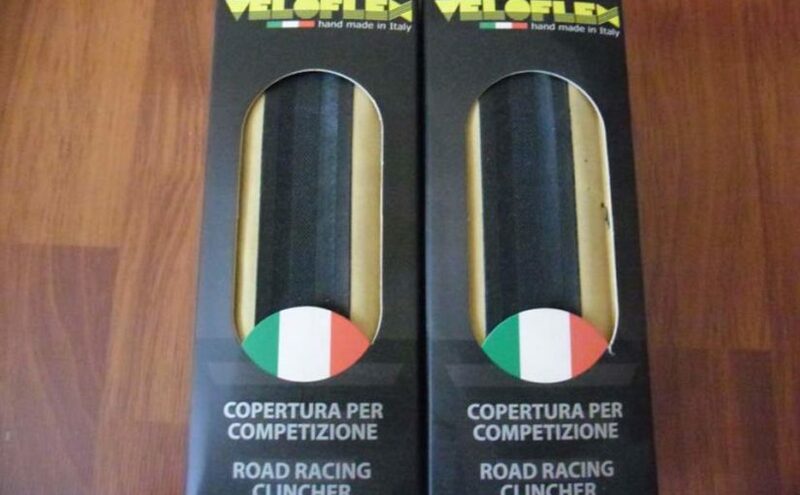 For racing, I don’t think that I will use any other tire than Veloflex Master. For training, especially winter training, they’re a bit expensive. Veloflex Master tires on the wheels. My Look 565 with Veloflex Master Clincher 700x23c tires is ready to go! Expensive (for training, for racing-the price is OK). Wears out quickly (for training, for racing-it is OK). Hard to mount on the rims.